This is one of the best shows I’ve watched in a really long time. With each new episode, I am amazed at how good it is. I keep thinking, How could it possibly get any better? Then it does. And to top it all off, this is a Netflix original series. I thought that any show made by and for Netflix could not possibly be any good (House of Cards). Wow was I wrong. This show alone is worth the price of admission for a Netflix account. It’s so unlike that other one. The only down side, season one only has eight episodes, and I’ve already watched half of them. They were all released at the same time on July 15th. I only have four left before I have to wait for season two. Given the July release of season one, I can only surmise that I will have to wait ten months for the second season to hit the net. That is entirely unacceptable. 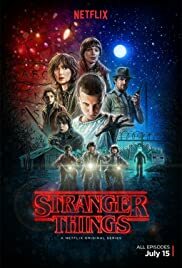 If you have not yet watched Stranger Things, stop everything and go watch it right now. Seriously, stop reading this and go watch it. Right now.